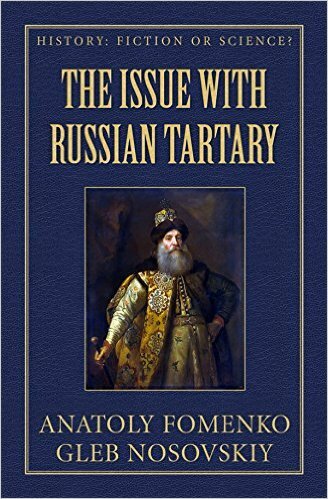 The Issue with Great Tartary' is a very big one, as the Great or Russian Tartary was according to British Encyclopedia History, edition of 1771 the biggest state in the world! This enormous state has dissappeared without a trace from all subsequent editions of Britannica. Clerical mistake? Enigma clouded in mistery? Solved! Why then the mainstream historians do not shower mathematician Academician Dr.Prof Fomenko with thanks and laurels? The Russians can not: because Fomenko asserts that there was no such thing as the Tartar and Mongol invasion followed by three centuries of slavery, providing a formidable body of documental evidence to prove his assertion. The so-called "Tartars and Mongols" were the actual ancestors of the modern Russians, living in a bilingual state with Arabic spoken as freely as Russian. The ancient Russian state was governed by a double structure of civil and military authorities. The hordes were actually professional armies with a tradition of lifelong conscription (the recruitment being the so-called "blood tax"). Their "invasions" were punitive operations against the regions that attempted tax evasion. Fomenko proves that Russian history as we know it today is a blatant forgery concocted by a host of German scientists brought to Russia by the usurper dynasty of the Romanovs, whose ascension to the throne was the result of coup d'état, charged with the mission of making their reign look legitimate. Fomenko proves Ivan the Terrible to be a collation of four rulers, no less. They represented the two rival dynasties - the legitimate rulers and the ambitious upstarts. The winner took it all! Over some 30 years of controversy, Russian historians have made a most remarkable transition - they were initially accusing the young mathematician Fomenko of anticommunist dissident activity and attempts to deface the historical legacy of Soviet Russia; nowadays the middle-aged mathematician is accused of adhering to "pro-communist Russian nationalism" and defacing the proud historical legacy of Great Russia. The Westerners will not: because Fomenko blows consensual Russian history to smithereens, successfully removing a crucial cornerstone from underneath the otherwise impeccable edifice of World History. Fomenko adds insult to injury, wiping out one by one the Ancient Rome (the foundation of Rome in Italy is dated to the XIV century A. D.), the Ancient Greece and its numerous poleis, which he identifies as the mediaeval crusader settlements on the territory of Greece, and the Ancient Egypt (the pyramids of Giza become dated to the XI-XV century A. D. and identified as the royal cemetery of the Global "Mongolian" Empire, no less). The civilization of the Ancient Egypt is irrefutably dated to the XII-XV century A. D. with the aid of the ancient Egyptian horoscopes cut in stone. He was the first one to decipher and date all such horoscopes, coming up with mediaeval dates in every case. English historians rage at the suggestion that the history of Ancient England was de facto a Byzantine import transplanted to the English soil by the fugitive Byzantine nobility. To reward the English historians who consider themselves the true scribes of World History, the cover of the present book portrays Tintoretto's Jesus Christ crucified on the Big Ben. The Chinese are lost: because Fomenko wipes out the Ancient History of China outright. No such thing. Full point. The compilation of the so-called Ancient Chinese History is reliably datable to the XVII-XVIII century only. It is perfectly recognizable as the Ancient European history, reworked and transcribed in hieroglyphs as yet another historical transplantation, this time performed on the Chinese soil by the loving Jesuit hands. The Chinese are the next in line to go berserk. Chinese history is inevitably bound to get both more ancient and more eventful, proportionally to the growing involvement of China in the world affairs.